Daredevil™ spade bits are designed for professional users seeking speed, ease of use and hole quality. A full-cone threaded tip pulls the bit through the material with less effort and vibration than other spade bits. 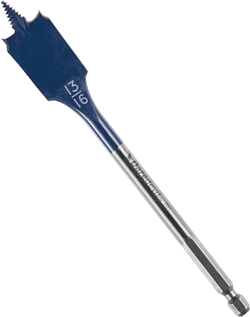 The contoured paddle delivers faster chip removal; hex shank with power groove reduces slippage. Up to 10X faster than conventional spade bits.